Thrifty and Frugal Living: Blog Awards Galore! Thanks to B Sparkly and The Cooking Lady for this wonderful award! Please check out their sites when you get a chance!! 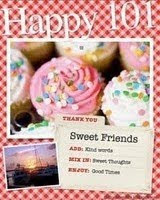 The next award I received is the Happy 101 Blog Award. 3. 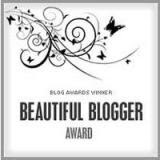 Wonderful bloggers like Jenn! Congratulation on the awards!!! You deserve them allJ Thank you for giving me my 3rd award I’m so Happy every time I get one. I’ll keep it going…. Thank you so much for the award thanks for thinking of me. Thanks so much for the award!! However - my give away blog is award free! It's just so hard to keep up with the features and give aways. Congrats on your awards and thanks so much for mine. I will be posting about it later this week and will add to my about page. Yay! Crystal, Thank you sooooo much for my award. I am soooo honored!!!! I wanted to give you the link to the post I made. Thank you again!!! Thank you so much for this award! I'm just getting caught up, and have just posted it. Wow! Thanks so much! Sorry I didn't comment sooner. I was trying to get my girls out and to Nanny's for a little early Spring Break! I'll have my post up soon!